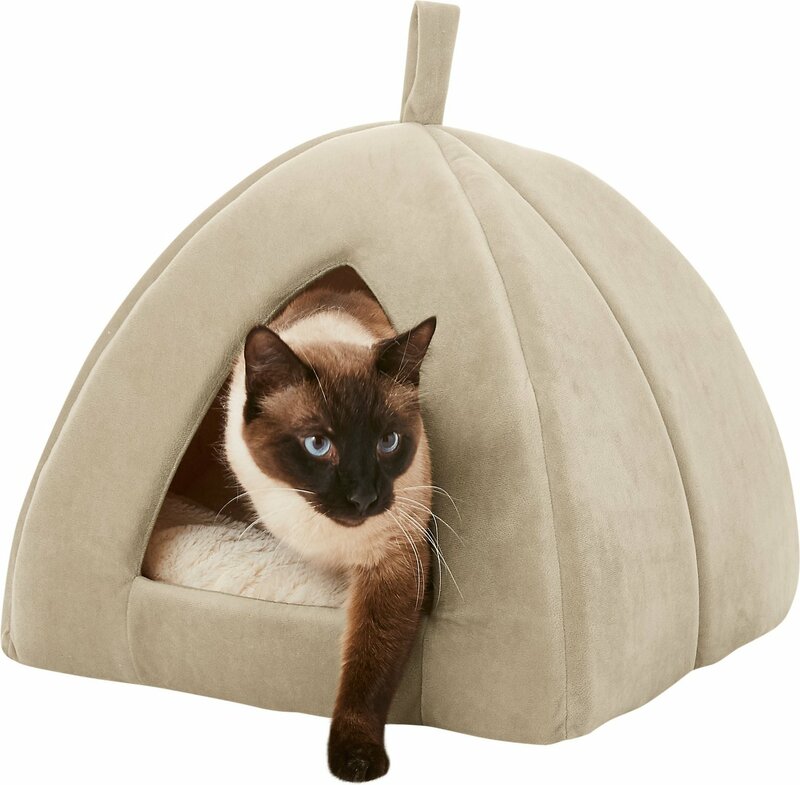 Give your pet a cozy spot to rest their paws with the Frisco Cat/Dog Tent Bed. 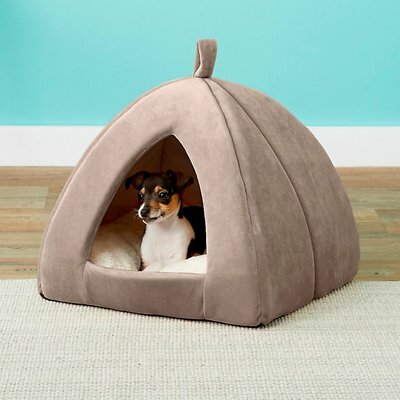 The super-soft plush fabric and enclosed tent shape make this pet bed the perfect hideaway. Puppies will enjoy having a den-like home to curl up in, and kitties can settle in for quiet naps. With a removable cushioned pillow, the Frisco Cat/Dog Tent Bed is a comfortable retreat that you can set up at home or take along with you on trips. It’s machine washable for easy cleaning, and comes in a natural sandy beige color that will blend in with your home décor. This bed is available in two sizes to fit puppies and cats of all sizes. Made with a super-soft material that gives pets a cozy place to snuggle up in. The tent shape turns this bed into the perfect hideaway. Dogs love having a den-like bed to curl up in, and kitties will love having a quiet, private place to sleep. This versatile pet bed comes with a removable cushioned pillow. You can set it up at home or take it along with you when you travel with your pets. Both the pillow and the tent are machine washable for easy cleaning. Comes in a natural sandy beige color will fit in with your home décor, with two sizes to fit pets of all ages. Machine wash cold. Gentle cycle only. Wash separately, do not bleach, tumble dry low, reshape as needed. For best results hang to dry. Give your pets their very own place to rest their tired paws with Frisco's ultra-plush pet beds. Whether they're used to daytime sleep breaks or just need a good night's sleep, your furry family members can rest easy on these cushioned beds made with soft-to-the-touch fabric. To make them even comfier, they're covered in soft faux suede and stuffed with fluffy polyester fiber filling. Frisco pet beds come in solid, neutral colors to go with your home décor, and they're machine washable for easy care and cleaning. From teeny tiny to big and mighty, Frisco beds come in plenty of sizes for just the right fit. Sleepy-eyed pets can snooze the day away as they nestle down into Frisco's deep-sided bolster beds. Made for maximum comfort, these cozy beds have raised sides that are soft but still offer gentle support for your pet's head and paws. Once your four-legged friend makes the perfect nest and settles in, they'll soon be fast asleep and busy counting sheep. Choose from round bolster beds for curling up in or a rectangular shape that fits nicely in the corner of any room. Frisco's pillow beds offer an easy-on, easy-off design so your pets will have no trouble getting on or stepping off after their nap. This works great for smaller pets, puppies and kittens who struggle with taller bolster beds, and also for adult and senior pets who have a hard time getting back up on their feet. With a flat sleeping surface and ultra-plush fabric on top, this bed is built for pets who love to curl up, as well as those that love to stretch out. Frisco created special cat cave beds for kitties that need a little R&R in a quiet place away from the daily household commotion. These snuggly cocoons provide a cozy retreat where your cat can catch up on some z's in a spot that feels safe and secure. 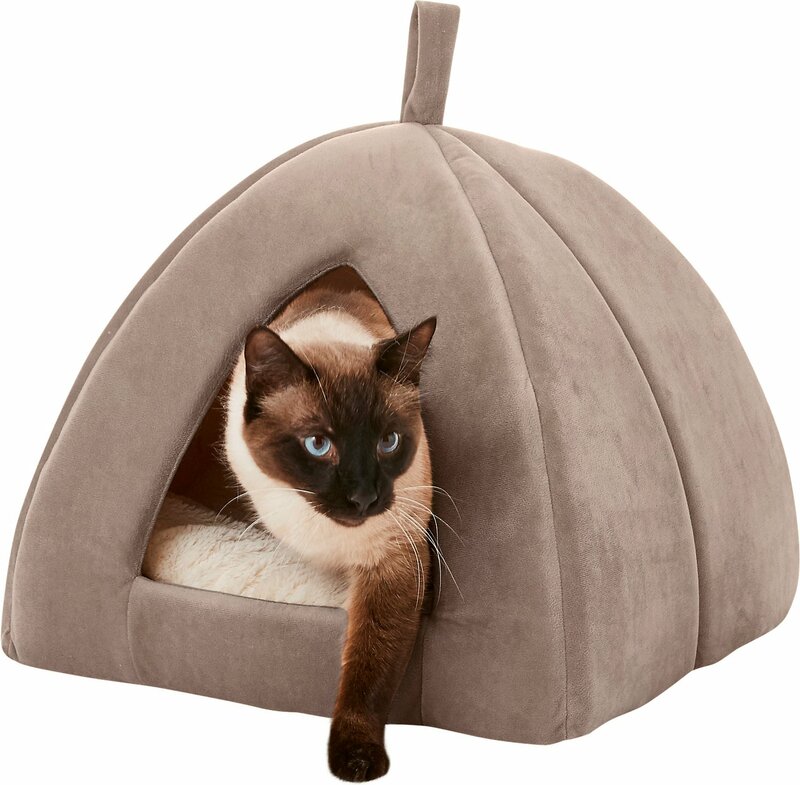 With a cushiony interior for your kitty's comfort, and a soft, neutral-color exterior, it's the perfect place for lounging, hiding, resting or falling into a deep sleep. Classic round shape features cozy raised sides. Rectangular style with easy-step through design and raised sides for gentle support. Easy-on and easy-off design with a plush, flat sleeping surface. A super soft hooded bed offers a private, comfy place to rest. 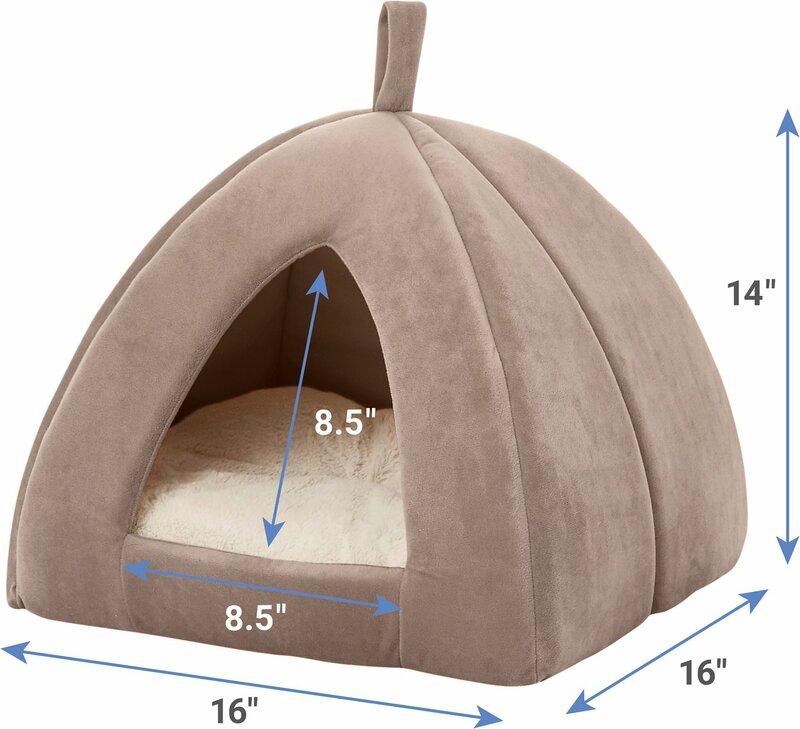 Cozy tent shape gives dogs their own den and offers cats a quiet place to sleep. Features a pull-down canopy, removable pillow and fun hanging ball toy. I bought it for my cat before this winter. He has been so picky about cat caves and actually never liked any of them I purchased before. In a few days after my purchase, he was comfortably sleeping inside. It also keeps the inside of cave very warm with his own body temperature. He also likes the very cushy cushion. So I think it makes it perfectly warm and comfortable. Also, I personally love it’s very stylish design, form and texture!!! I just moved and it was easy to fold and put in a luggage. My cat can be very sensitive with a new environment just like any others. With the cave, he felt relieved to have his own ”house” and got adjusted to the new place very quickly! Well, actually only inside camping. My 17 pound Russian Blue won't get inside this tent with the pillow inside - he apparently thinks it's too small for him, but he loves it with the pillow removed. A small to regular sized cat or quite small dog would fit much better with the really soft pillow in it. This was a lot bigger than his former bed..I got the large size based on his weight of 14 pounds..he sniffed it, slowly walked into it, and hasn,t left it since. It is soft, large comfy pillow, and he finally has room to stretch out and sleep, as opposed to his former fabric structure,where it was a lot smaller. HIGHLY recommend this bed. I tried to,add a photo, but wasn,t able to..so I gave up. I originally ordered the large tent bed for my new rescue, Bonnie, who is a 9 pound minature pinscher. She fell in love with the bed as soon as I put it out for her. The tent shape is the perfect size, the removable reversible pillow is great and easy to clean. My cat liked the tent bed so much that I purchased the smaller size for her. Our cat LOVES this bed! At first I thought this bed was too small for our 16 lb. cat. He didn't seem to want to go into it. BUT in less than 24 hours I found him in there and he's been sleeping in it all day. It's a big hit! Got this bed for my 2 little dogs and they did not want to go into the tent at all but my cat on the other hand loves it and sleeps in it just about every night !! Good quality too. My puppy went right in and lay down. She slept through the night, I had to wake her up in the morning!! Usually she wakes up at 6 and wakes me up. This bed is so plush and well made! Super comfy and my puppy lovessss it! Great value for the price. Highly recommend.